A new decision-making structure, less EU level competences, and Latin as the official language in Brussels are just some improvements Beatrix von Storch says would help turn the EU right-side up. Beatrix von Storch is fourth on the list of the Eurosceptic Alternative for Germany’s (AfD) candidate list for the 2014 European elections. If the AfD reaches 7%, as current opinion polls predict, she could win a seat in the European Parliament. She spoke with EURACTIV Germany’s Patrick Timmann. Where on the political spectrum would you categorise the Alternative for Germany (AfD) party? That is not so easy. On many topics, our positions overlap with those of various other parties. I recently attended an event with European Commission President José Manuel Barroso. There were anti-Fascists in the back of the room chanting slogans like “Stop the Troika!”. I can agree with them on that, for instance. The anti-Fascists reject austerity policy imposed by national representatives and a Troika that is not elected, and the AfD is doing that as well. Yes and no. I consider the undemocratic regulation of policy through the Troika to be wrong. We see how brutal austerity policy is harming the people in Greece. Now it is primarily about interest earnings and redemption sums for creditors to generate profits on the backs of the people. We clearly reject this. Whether this position is left or right, I do not know. It is just correct. In its regulatory policy the AfD is more liberal: We do not want manipulation of the people by the state. We stand for ending total surveillance and unjustified surveillance of all forms of communications by domestic as well as foreign intelligence services. We are against data retention and against the SWIFT agreement. On this issue, we represent similar positions as the [liberal] Free Democratic Party (FDP). The difference is that you are focused on national solutions. But that seems impossible, particularly with regard to issues like data protection. As a matter of fact, there are a few areas which could be better regulated on the European level: the issue of asylum, for example. There, we should come to an agreement with our European neighbours on a common asylum law. In light of the suffering endured by refugees, it is clear that regulation at a national level is not constructive. We could find a common solution on this. At the same time, you are calling for a veto right for individual EU members. But somehow, for whatever reason, one country will always be against a proposed EU regulation. How can any decisions be made in a system like the one you are proposing? This is where my democratic understanding differs from yours. If a majority in a country rejects a legislative decision, then it should be rejected. Whoever believes people should be forced to accept something that is against the will of the majority, has an understanding of democracy shared neither by me nor the AfD. But a nation-state understanding of democracy could fall short when it comes to problems that can only be solved at a multilateral level? Which areas should be compulsorily regulated at a supranational level? We must define these areas. And then we can assemble agreements, which would develop a community effect – on asylum law for example. At the moment, we already have a large amount of competence at EU level, which continues to expand. Brussels has a tendency to draw more and more competences into its own remit. If there is a majority against an EU decision within one of the member states, then these countries should be able to reject the regulation – and not only a regulation on vacuum cleaners. In a democracy, one must listen to the people – otherwise it will be lost. The argument that people simply do not understand many things, comes with a certain amount of disdain for the population – as if people are too dumb to understand what is right. 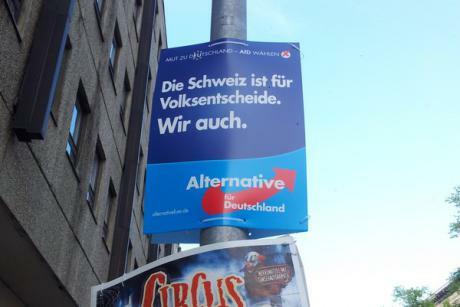 On its campaign posters, the AfD is calling for referenda like those in Switzerland. With 26 cantons, Switzerland has almost as many regions as the EU has member states. And in Switzerland, the losers in a referendum are also bound to the decision of a majority vote. Why should that be different in the EU? Democracy means rule of the people over their own nation and not over another. You say that a majority in other countries should be allowed to decide over a majority – for example in Germany. That is not democratic. And it is simply proven by the fact that it does not lead to acceptance among citizens. In closely defined areas – determined by fundamental approval in referenda among the citizens – in which community solutions should be found at a European level, democratically legitimate committees should be allowed to make decisions. Then that could be the European Parliament, if it were democratically elected – which it currently is not. Should Germany have more seats in the European Parliament? The AfD is calling for a reform of the European institutions as a whole, along with a restoration of European competences to the national level. Once we have achieved this, we can talk about reforming the European Parliament. For example, the issue that elections are not democratic. In the European Parliament, 800,000 Germans are represented by one MEP; Luxembourg has a ratio of 1 MEP to only 80,000 citizens. As a result, a German’s vote is worth 10 times less than that of a Luxembourger. That is not democratic. Every voter should have a voice. What do you disapprove of in the other EU institutions? The entire EU structure is upside down. The European Commission is understood to be an executive body. And, according to Barroso, even a kind of administrator of justice. And this executive body simultaneously takes on the most important legislative function: It initiates legislation. That has nothing in common with a state under the rule of law and separation of powers. Unelected delegates from the member states initiate laws, and the Parliament is then allowed to discuss these proposals. The AfD intends to cut the number of Commissioners in half. But in that case, not every country would be represented in the European Commission all the time. Do you not see that as a problem from a democratic perspective? The EU Commissioners are a nice example of the European Union’s schizophrenia. According to their own description, the Commissioners are not representatives of their states, but rather exclusively representatives of the common European interest. But apparently no country can define this European interest, so ever member states still insists on having their own EU Commissioner. Even Germany. That alone shows (that) the individual states do not believe in the fact that the EU Commissioners are really impartial. We must decrease the number of Commissioners, since we must change the whole EU system. We want to reform the EU system as a whole, so that the European Commission will lose a substantial amount of its significance. According to the AfD’s election agenda the 50,000 employees currently working for the EU should be cut in half within seven years. At the same time, your party is saying that as many EU documents as possible should be translated into German. But this would require many more translators than the number currently employed by the EU. How does that fit together? If the EU makes less laws – simply because there are less competence areas that must be dealt with at an EU level – then the problem will solve itself. Furthermore, I do not believe the EU should become an elite project, which can only be followed by those who are fluent in at least one other language, both orally and in writing. With the consequence that even more translators must be hired. Right. That is why the EU does not function as a democracy in its current form. Democracy requires that we be able to discuss with one another in a cohesive public setting. That is not possible with the multiplicity of languages we have. That is a big problem which can only be solved if we agree on a common language. That would probably be English. Why not? Then it would be just as difficult for everyone and no one would have the advantage of being able to dominate every discussion. But this can be discussed for a long time – the fact remains that a common state with 24 languages does not work. Three languages, like in Switzerland, still just barely function well. Above all, when a state is organised in a relatively decentralised fashion. In that case, most discussions take place at a local and regional level – and the decisions are also made there. Even if all EU documents and speeches were translated into English, the problem would remain that a majority of the population in the EU and in Germany does not speak adequate English. Is it not enough that those directly involved can speak with one another? Democracy is not about employees in the institutions being able to communicate with each other. The citizens must be able to join the discussion. In the EU’s case, these discussions would have to take place in 24 languages. Even if all the documents were available in German, hardly anyone who is not actively working on the relevant issue would read them. Not all 80 million people in Germany must be involved in everything. But the people must still have the opportunity to follow the debates and read the legislative drafts. One cannot simply give them the final result in their own language, after the legislation was negotiated in a different language. That is too thin for a democracy. A lively, direct exchange is essential. Good heavens if we give the people access to the debates and legislative drafts they will get ideas above their station and no doubt ask awkward questions about the attendance and expenses claimed by their representatives. That will never do, will it? Good on the Latin. That ought to shut them all up for long enough for rationality to surface somewhere on the planet. And it would give place of preference to traditional Catholics and their numerous children. It would even help restore Latin to the Church, lost at Vatican II, where the use of the vernacular has splintered the structure into self-serving national churches. This lack of commonality hurts the sheep terribly.